On to the what where why and how. Our forum software (phpBB) was badly out of date. This had a lot of implications. We were prone to bot attacks, since we didn't have reCaptcha like we do now. We were becoming more and more prone to security vulnerabilities and potential hacking attempts as well, as it happens when one runs an out-of-date software. And, to be frank, phpBB is garbage. But it gets less-gabagy with each update. Turns out 3.2, the newest (and what we now have), is really a lot better than the old version. Ah. You mean "why does it look so different and in many places broken, stylistically-incoherent, or just..bad?" That's because this upgrade to the new version of phpBB is not backwards-compatible with old styles. You can thank them for that, I didn't make the decision I had to go hunt down a decent-looking theme (and there aren't that many decent-looking themes yet that support this new version). I spent a longggg time modifying this theme's various bits to make things look at least somewhat familiar (you can also thank Talvieno, who pointed out a lot of good CSS changes to make this better). But alas, I grow tired of writing web-related code and would now like to get back to writing real LT code. So I'm going to open the forums. Obviously, if you find something that's broken in a big way -- especially if you run into any kind of hard server error that spews words like 'php or MySQL' -- please report it here. The small stylistic issues are mostly known. I haven't been able to go through every part of the forums and change them to be coherent. So far I have focused mainly on the front page and the topics listing views. Soon I'll dedicate more time to making viewing an actual topic's posts a bit more pleasant. It'd be helpful if people reported not only bugs, but big 'quality of life' concerns. I can see pretty clearly when things look bad or are stylistically incoherent. I'm good with graphics But plenty of you guys spend more time on the forums than I do, and if this upgrade has made this place less pleasant, I want to know about it. Especially if it's something that I can fix easily. The good news, despite this whole process being a major PIA, is that I now have a lot more control over the forums. It was...sort of out of necessity.....that I had to learn a whole lot about phpBB in a very short period of time.... But the major upshot of that is that I'm pretty cozy with the forum code now, and can change things that need changing. Where are the 'view new posts / active topics' buttons!? Yeah...so..that wasn't really a lot of information. Nor did I make a 'known issues list.' Look guys, I'm tired and I want to get this bad boy back online, ok? So deal with it for now I promise this place is only going to get better and better! Hey guys! Talvieno here. Josh has given me a special style to develop on, and I'll be updating it regularly as I bring the forum's appearance back to where it should be. If you want to access it, click your avatar button in the bar at the top right of the screen, and select "User Control Panel". From there, navigate to "Board Preferences" and select "DevRavaio" from the "My board style" dropdown. Edit June 11th: Josh has integrated DevRavaio with the normal board style, and it no longer exists. Edit June 12th: Josh has given me access to re-integrate DevRavaio. If you don't mind some weird stuff happening on occasion, you could check it out to help with development. - There are now icons next to post titles to show you whether you've read a post or not. - Icons now much easier to see for colorblind folks. - Searches now display the date of posts! Hurray! - Icons in navbar are now actual images instead of fonts. Should work properly for everyone and anyone. - Icons in navbar are re-centered. - EMOJIS ARE DEAD. LONG LIVE EMOTICONS AND SANITY. - Nevermind, emojis are back again. Power to the people!! - Polls look much, much better, although they still look somewhat fat. - Other assorted minor changes. - Changed the size of some elements on the main page to make them less "fat"
- Made PM view slightly less "fat"
- "Who is online" page is a bit more compact/less "fat"
So far, so good... looks okay! Last edited by Prack on Fri Jun 09, 2017 3:19 am, edited 1 time in total. I have a weird problem on firefox, that jumps to /_index.php instead of /index.php when going on the "home" selection. Does not occur on IE. Could be a problem with something cached. I'll go check it out. Later. After I unglue my eyes from terminal screens for a while...I think I'm getting burnt retinas. Damocles wrote: I have a weird problem on firefox, that jumps to /_index.php instead of /index.php when going on the "home" selection. Caching. Not sure how your cache knew that I had renamed the old, broken forums to _index.php when I swapped in the 'under maintenance' page...but apparently it knew. Hold ctrl and hit F5 on the front page of the forums and it should fix. Yeah, it's weird cause that's actually the unchanged code for my current sig. If open a topic while not logged in then I see 3 posts. 1st is fine. 2nd is the 3rd post with the 2nd posts user name and 3rd post is blank. Will quickly get a screenie but can someone else test it as well? Last edited by Prack on Fri Jun 09, 2017 3:38 am, edited 2 times in total. How did you center it previously? Whooops, I posted on the other thread. The edit button doesn't work on my stone age phone, Not the end of the world though, I suspect it's me, not you. And most of the time I post from my PC anyhoo....! Just a random thing that I noticed. The contrast between a particular posts background and the background of the site is basically non-existent (at least on my monitor with my eyes). This makes it a little difficult to coherently read through a topic as I can't easily tell where a post ends and starts, obviously there are other cues, but those are harder to see than different colors. 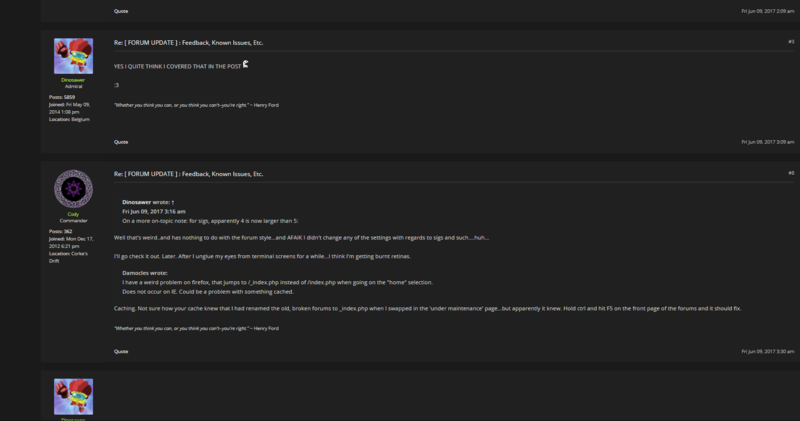 Maybe just add a border around posts or something, I can't remember what the old forums did. Over all I really like the new look and feel though, it feels more modern. Oh. Oh ok. I see what I did there. See the problem was that I was an idiot. And wrote bad code. Anyway, that's fixed. As for center not working....not sure.